Perhaps proving that hoarding random old bits and bobs isn’t such a bad idea, this extensive folk museum presents a fascinating collection of antiques that hint at what Phitsanulok was like in the past. Browse places to stay in Phitsanulok on Agoda.com. Free cancellation. Sgt. Maj. Thawee himself accumulated the bulk of it over several decades in the 20th century, with some of the artefacts dating back centuries. Spread over a grouping of traditional Thai style houses, the museum features textiles, coins, animal and fish traps, weapons, ceramics, Buddha images, cooking wares, giant ox carts, tools, khon masks and a set of photos showing the castration of a buffalo in jarring detail. The displays are often accompanied by comprehensible English explanations. 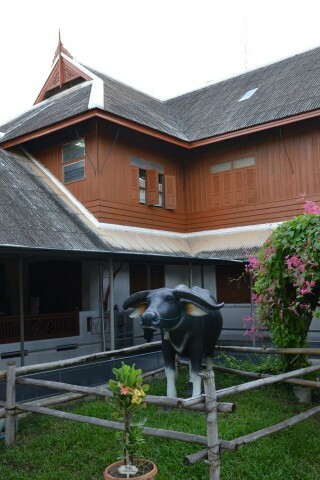 If you want to get a feel for how Thais lived in centuries past, this museum is a must. You’ll also find a small souvenir shop and cafe on the site. While you could breeze through in 20 minutes, plan on a solid hour to get the most out of it. The entry fee is 50 baht per person. Across the road from the folk museum and under the same management, visitors can watch bronze Buddha images being cast using the lost wax method. A small shop on the premises sells a range Buddha products. Admission is by donation and opening hours are the same as the museum. It’s only really worth a look if you’re already in the area. A small bird sanctuary is also located here. The museum is located fairly far to the south of downtown off Sanam Bin Road. A motorbike taxi from the train station should cost 50 baht one-way. Browse our independent reviews of places to stay in and around Phitsanulok. Read up on where to eat on Phitsanulok. Check out our listings of things to do in and around Phitsanulok. Read up on how to get to Phitsanulok, or book your transport online with 12Go Asia. Planning on riding a scooter in Phitsanulok? Please read this. See below for more sights and activities in Phitsanulok that are listed on Travelfish.org.